A file with the .MKV file extension is a Matroska Video file. It's a video container much like MOV and AVI, but also supports an unlimited number of audio, picture and subtitle tracks (like SRT or USF). This format is often seen as the carrier for high-definition online video because it supports descriptions, ratings, cover art, and even chapter points — which is why MKV was chosen as the default video container format for the popular DivX Plus software. Your best bet for playing most MKV files is to use VLC. If you're on Windows, some other MKV players include MPV, MPC-HC, KMPlayer, DivX Player, MKV File Player or The Core Media Player. Some of those applications will open an MKV file on macOS, too, as can Elmedia Player. Though not free, Roxio software can be used to play MKV files on macOS as well. On Linux, open MKV files using xine and some of the programs above that work with Windows and Mac, like VLC. Play MKV files on iPhones, iPads, and iPods with the free PlayerXtreme Media Player or VLC for Mobile apps. VLC works with Android devices as well, as does Simple MP4 Video Player (it's named as such because MP4s and other video formats are supported). Use the CorePlayer mobile software to open MKV files on Palm, Symbian, Windows Mobile, and BlackBerry devices. However, the software is not free. 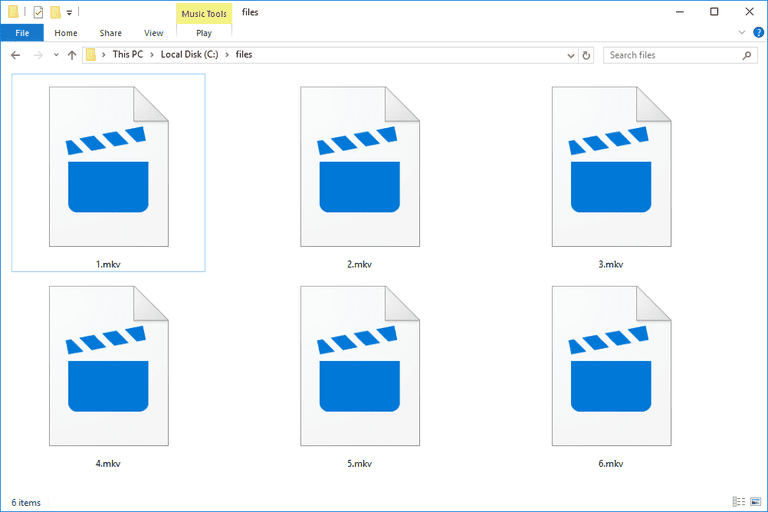 Since you might need different programs to open different MKV files, you can always change the default program for a specific file extension in Windows. This step becomes necessary if, for example, KMPlayer is trying to open an MKV file that you instead want or need to use with DivX Player. The Matroska.org website presents a list of decoder filters that must be installed for certain MKV files to play on your computer (in the Additional playback Information section). For example, if the video is compressed with DivX Video, you must install either the DivX codec or FFDshow. A free video file converter is the easiest way to convert an MKV file to a different video format. Since videos files are usually pretty large, an online MKV converter like ConvertFiles probably shouldn't be your first choice. Instead, use a program like Freemake Video Converter to convert the MKV to MP4, AVI, MOV, or even straight to a DVD so you can burn the MKV file with little effort or knowledge of movie burning. Freemake Video Converter is also useful if you want to copy a DVD to the MKV format. As with any other video type, you can add new subtitles to an MKV video or even remove them, plus make custom chapters for the video. Try editing with the free entry-level MKVToolNix program for Windows, Linux, and macOS. Supported subtitle formats include SRT, PGS/SUP, VobSub and SSA. You can delete subtitles that are soft-coded into the MKV file or even add your own custom subtitles. The Chapter Editor portion of the program lets you make start and end times for custom video chapters. For other tips or help using MKVToolNix, see the online documentation. To edit the length of an MKV file, cut out portions of the video or merge several MKV videos together, use the Freemake Video Converter program mentioned above. Because the MKV file format is just a general container format, it can hold several different tracks that each use different compression formats. Accordingly, it's not so easy to depend on a single MKV player that can open every MKV file you have. Certain decoders are necessary for certain encoding schemes, which is why some MKV files may work on one computer but not another—the program that reads the MKV file must load the appropriate decoders. Check out the list of decoders on the Matroska.org website. Files in the MKA format are just Matroska-related audio, without video. Matroska 3D Vide) files are used for stereoscopic video and Matroska Elementary Stream files just hold subtitles. These formats present with the MK3D and MKS file extensions, respectively. The Matroska project is supported by a non-profit organization and is a fork of the Multimedia Container Format. It was first announced to the public at the end of 2002 and is a completely royalty-free open standard that's free for both private and commercial use.